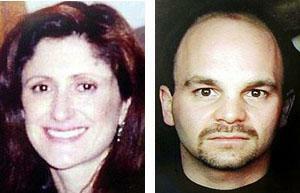 Undated photos of Jeanine Sanchez Harms of Los Gatos and Maurice Xavier Nasmeh of San Jose. Nasmeh was arrested Dec. 16, 2004, in connection with the 2001 disappearance of Harms. Ultimately, Jeanine Harms' hobby led investigators to charge Maurice Nasmeh with her murder. The forensic investigation was the stuff of TV's ``CSI,'' unfolding in real time, over 17 long months. Tiny yarn fragments from her hooked rug project, painstakingly collected from a carpet that investigators believed was used in disposing her body, were found to match yarn in Harms' home and fibers in the cargo area of Nasmeh's SUV. Mark Moriyama, a criminalist with the Santa Clara County District Attorney's Crime Laboratory, extracted thousands of fibers from the carpet by pressing 4-inch-square pieces of tape across its entire surface, and then examined them all under specialized microscopes. The analysis took 90 percent of his time for more than a year. Almost from the day Jeanine Harms disappeared in July 2001, police began focusing their investigation largely on architect Nasmeh, who had accompanied Harms home that night after meeting her in a bar. Police knew Harms hadn't just walked away from her life of close ties with family, friends and co-workers. They assumed she was slain, but there was no body, no witnesses. What they needed was evidence. They found it in a 5-by-8-foot wool Persian-style rug that had vanished from Harms' Los Gatos duplex the night she died, and turned up two years later in the possession of a woman who had found it discarded shortly after Harms went missing, and taken it home to use. On Friday, Nasmeh was formally arraigned on a charge that he murdered Harms. He did not enter a plea, but outside of court, his lawyer blasted police and prosecutors for revealing the evidence that led to his arrest. Lawyer John Hinkle suggested such publicity could taint a jury pool, and said he planned to ask the judge for a gag order and possibly to move the trial to another county. For now, Nasmeh remains in the Santa Clara County Jail without bail. His next court appearance will be Jan. 14. When the rug surfaced in 2003, after police issued a public plea to help find it, Moriyama rolled up his sleeves and went to work on the biggest case he'd ever tackled. Seventeen months later, the trace fibers he identified on the rug and matched to Harms' home and Nasmeh's car led to the 40-year-old architect's arrest Thursday for the woman's murder. The process is painstaking, and because highly specialized equipment in different crime labs is used, the work often takes months. Moriyama was looking for a certain kind of fiber in his investigation -- yarn from the crafts project Harms had worked on. Detectives learned of the project in an interview with Harms' mother, and the fiber, unique to the brand of craft kit Harms used, gave investigators something specific to look for. Moriyama says a 4-inch-square tape lift of fibers thinner than the thinnest human hair can take anywhere from one hour to several days to examine. Along with his microscope analysis, Moriyama takes time to document even the smallest findings on a nearby computer. He also must call and interview rug or fiber manufacturers and meet with police and district attorney investigators on evidence and other information. Although it may seem astounding that the rug yielded evidence after lying on someone's floor for two years, being walked on and cleaned, Moriyama said there were plenty of fibers that remained deeply embedded in its thick nap, and which ultimately yielded what investigators were looking for. Also Friday, Hinkle said the timing of Nasmeh's arrest was suspicious, coming so closely after the conviction of Scott Peterson, another highly circumstantial case. He suggested that after more than three years of investigation, an arrest now looks like authorities might have been trying to link the two cases in the public's minds. Prosecutor Dale Sanderson denied any such attempt. Hinkle said Nasmeh ``is no Scott Peterson.'' He described his client as a talented architect and music lover who plays in a blues band. Nasmeh graduated from the University of California in 1987 with a bachelor's degree in architecture, according to the California Architects Board. He is a principal in the Campbell firm Sugimura & Associates Architects. Anyone with information about the Jeanine Harms case is urged to contact the Los Gatos-Monte Sereno Police Department at (408) 399-5731. Mercury news staff writer Mike Zapler contributed to this report. Contact Connie Skipitares at cskipitares@mercurynews .com or (408) 920-5647.